Russian photographer and Hebrew poet; born at Grodno, Russia, 1841; died in St. Petersburg March 23, 1900. He obtained his early education in the yeshibot, but at the same time, like the other Maskilim (see Maskil) of his age, he studied secretly the Hebrew language and literature. He lived in a very fanatical circle, and was bitterly persecuted for striving after secular knowledge. Eventually he left his birthplace and went to St. Petersburg. There he entered the Academy of Art; but after a short time he left it and learned photography. As a photographer he published an album containing portraits of Russian writers and a collection of illustrations to "Sapiski Sumashedshavo" by Gogol. 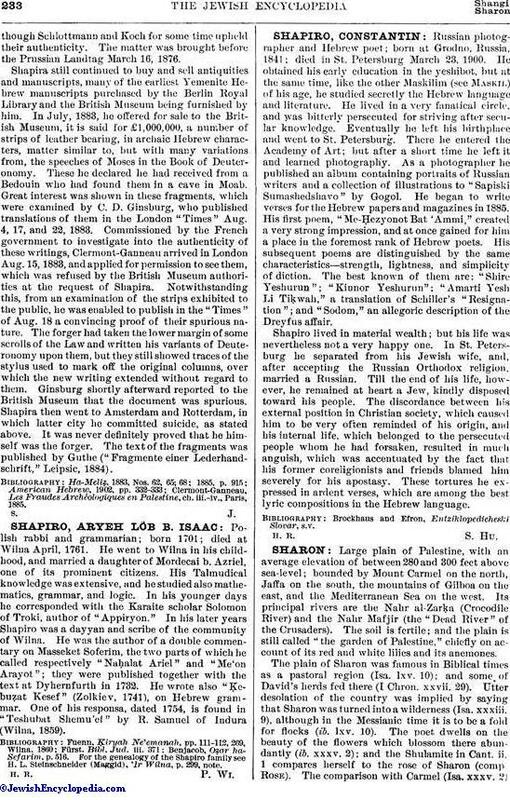 He began to write verses for the Hebrew papers and magazines in 1885. His first poem, "Me-Ḥezyonot Bat 'Ammi," created a very strong impression, and at once gained for him a place in the foremost rank of Hebrew poets. His subsequent poems are distinguished by the same characteristics—strength, lightness, and simplicity of diction. The best known of them are: "Shire Yeshurun"; "Kinnor Yeshurun"; "Amarti Yesh Li Tiḳwah," a translation of Schiller's "Resignation"; and "Sodom," an allegoric description of the Dreyfus affair. Shapiro lived in material wealth; but his life was nevertheless not a very happy one. In St. Petersburg he separated from his Jewish wife, and, after accepting the Russian Orthodox religion, married a Russian. Till the end of his life, however, he remained at heart a Jew, kindly disposed toward his people. The discordance between his external position in Christian society, which caused him to be very often reminded of his origin, and his internal life, which belonged to the persecuted people whom he had forsaken, resulted in much anguish, which was accentuated by the fact that his former coreligionists and friends blamed him severely for his apostasy. These tortures he expressed in ardent verses, which are among the best lyric compositions in the Hebrew language. Brockhaus and Efron, Entziklopedicheski Slovar, s.v.